This week my Aunt Donna passed away, and as a result I’ve been thinking a lot about my elementary school years. We lived in southern Florida, and my Aunt Donna and Uncle Bill lived just over the bridge. Their house was beautiful and they had a big yard full of hundred year old trees to climb. Their house was incredible, especially from a child’s perspective. My aunt’s collection of stuffed koala bear dolls, their bar that had treasure maps and sand and shells trapped under a sheet of glass. Aunt Donna even had the entire collection of original Nancy Drew books, a series that she lent me each and every one of. Dan and I drove up to New Jersey for the service, and I’m really glad that we did. I was reminded what a truly sweet, kind, and generous person Aunt Donna was. In listening to other people’s stories and anecdotes I realized that my experience with her hospitality wasn’t rare, that her home was open to anyone who needed a place to sleep, a book to read, or a lap to snuggle in. My heart broke for everyone sitting in that room- sisters, daughters, granddaughters, friends. I was just thankful that I got to know her, that I was afforded the opportunity to spend my childhood with someone like her. One food that really epitomizes my childhood for me is monkey bread. I loved making monkey bread, and I wanted to bring the ultimate comfort food with us to New Jersey. I used to love making it with my mother, and it should go without saying that I loved eating it just as much. Before we left on Monday I spent the day making it with my little friend Marin. It’s a really fun recipe to make, and there are a lot of dipping and kneading steps where little hands can play a big part. I bought this monkey bread dish from Williams-Sonoma, and it came with a recipe. I don’t remember how my mother made it growing up, but knowing her she made it from scratch. I’ve seen it done where people used canned biscuits, which tastes great, but I’m a from scratch kind of girl. The dough is easy to make, and while there is a lot of waiting involved (whenever there is yeast, there is downtime) it’s worth it. There are certain traditions from my childhood that I really can’t wait to pass on to my own kids, and baking is absolutely one of them. I have always loved being in the kitchen with my parents and grandparents, and I really cherish the nostalgia certain foods hold for me. 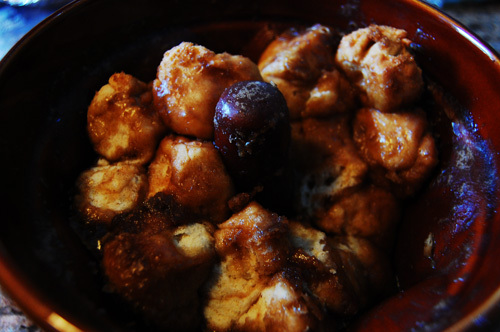 Few things will ever taste better than monkey bread to be because after one bite I am six years old again, begging my mother to make it. For the same reasons I cherish books and smells, certain movies and songs. One glimpse of a Nancy Drew book in a second hand shop and I can feel the warm breeze on my face, the excitement I felt as the plot thickened, swinging on a hammock in Aunt Donna and Uncle Bill’s back yard. Their house was home to my first serious injury (stitches in my foot from a barnacle), my first jet ski ride (moments before the stitches), some of my best birthday parties, and the first beer I ever poured from a tap (Uncle Bill taught me carefully how to pour it without getting any foam). I have a lot of really incredible memories of them, and remembering them with friends and family this week was really special. When I was a kid I would sit on her lap and count her wrinkles, and I know now that as I get older every wrinkle will make me laugh and remember what a kind, wonderful person she was. All ingredients should be room temperature unless otherwise noted. Whisk together milk, water, melted butter, sugar, egg, and yeast. 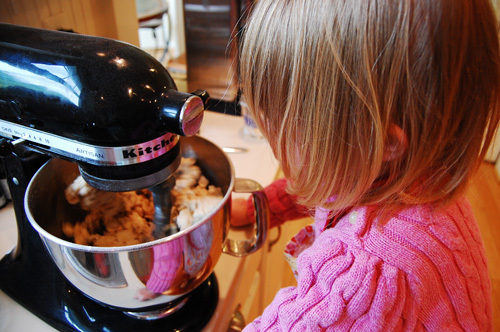 In a stand mixer fitted with the dough hook, quickly mix flour and salt. Slowly add milk mixture while it’s mixing at a low speed. Beat for about two minutes until a dough forms, and then increase the speed for an additional five, until the dough becomes smooth and glossy. 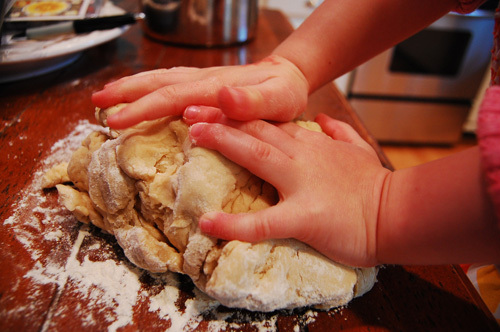 Turn the dough onto a lightly floured surface and knead for an additional two minutes. 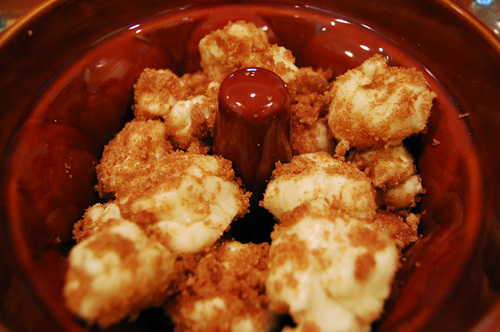 Oil a mixing bowl, place the dough ball in it, turn once, and cover with a damp towel. Let the dough rise for an hour. To make the sugar coating, whisk together brown sugar and cinnamon and melt the butter. Set it up in a line- dough, butter, sugar, baking pan. I made my monkey bread in the ceramic monkey bread dish I bought at W-S. However, you can make it in a bundt pan as well. When your dough has risen, cut it into about 40-50 square inch pieces. Roll each piece into a ball. 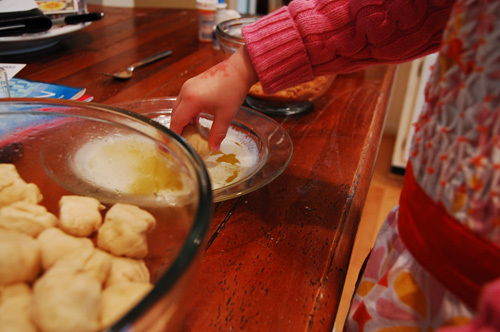 Dip the dough balls in butter, then in the sugar mixture, and then place in your baking dish. 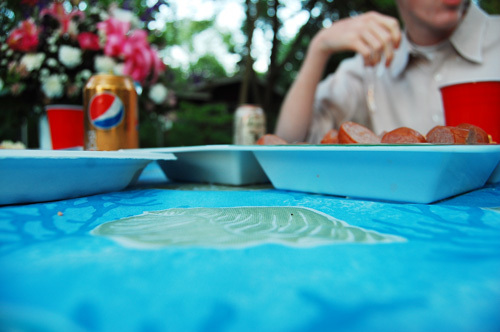 Cover the dish with plastic wrap and let rise an additional 45 minutes in a warm place. Heat your oven to 350. Bake the bread for 25 minutes, and then cover loosely with aluminum foil and bake an additional 30. You want the dough to be golden brown and springy to the touch. While your bread is baking, you’ll make your glaze. 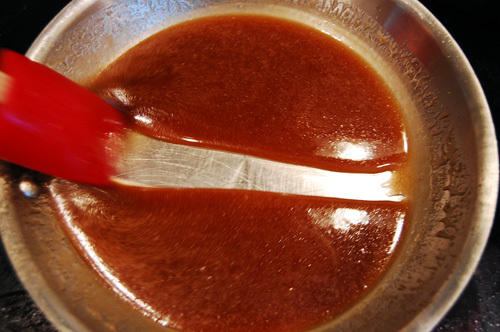 Heat your butter, syrup, cinnamon, and sugar in a pan and melt it all completely. It only takes twenty minutes or so over low heat. When the bread is baked and the glaze is done, pour the glaze evenly over the bread and let it sit for ten minutes. Serve and enjoy!